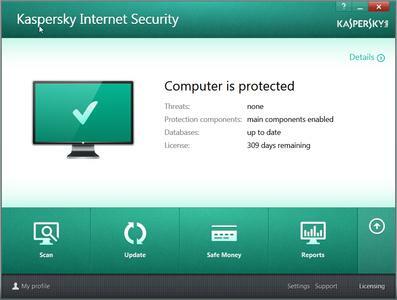 Kaspersky� delivers premium protection from viruses, Trojans, spam, hackers, and more. Its cutting-edge, hybrid approach to digital Security combines innovative, cloud-based technologies with advanced antivirus protection to deliver a faster, more effective response to today's complex, ever-evolving threats. You, your private data and PC are completely protected as you work, bank, shop and play online. Combines innovative, cloud-based technologies with advanced antivirus protection to ensure you're always safe from the latest threats. Helps you ensure your children are safe and responsible online while they're surfing the web, gaming and enjoying social networks. Ensures your Facebook, MySpace and Twitter accounts won't receive malicious links or software from your friends.